Awarded "Best puzzler" in MacWorld's "The best games of 2008"! Nominee for "Best Puzzle Game" in 2008 Best App Ever Awards! Getting tired of Sudoku? Why not try Marple? Marple is a game of logic and deduction. The playing field consists of 20 tiles arranged in 4 rows of 5 columns each and a set of clues. The goal of the game is to figure out the correct order of those 20 tiles using the given clues by process of elimination. There are 1,000,000 puzzles to play so don't expect to run out of them any time soon! At 3 minutes / puzzle, 1 hour / day = ca. 137 years of puzzles! Marple was inspired by the PalmOS game Hercule, created by Hippa-Potta Software. 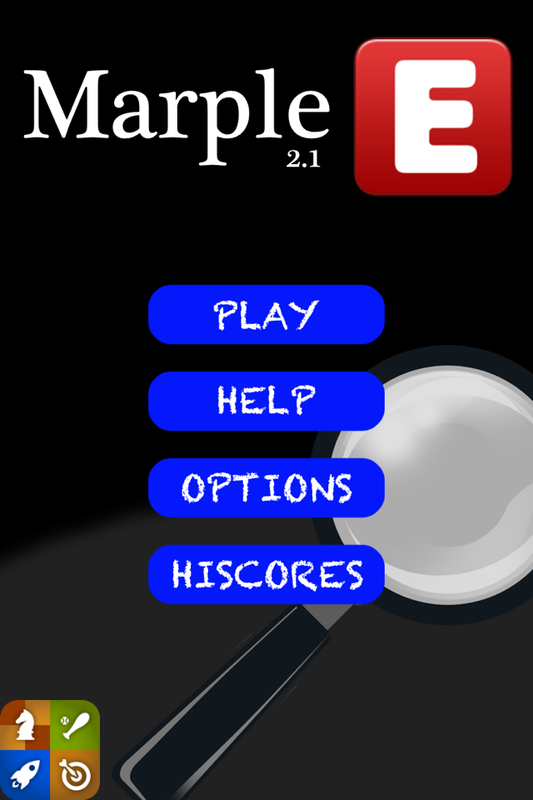 Marple is available at Apple AppStore. The game board consists of 20 tiles that are arranged into 4 rows and 5 columns. Initially each tile contains 5 parts that are specific to their row. The objective of the game is to eliminate tile parts so that only one unique part per tile remains. To help you solve the puzzle you're provided with a set of clues. The clues reside in a box below the tiles. "In between" clues consist of three different tiles. They indicate that the middle tile is located in between the other two tiles. It however doesn't tell the order of the other two tiles ( can be on the left side with on the right side or on the left side with on the right side). Also, it does not indicate that the tiles would be located in adjacent columns (for example, can be on the first column, on the second column and on the fifth column). "Left of" clues consist of two tiles with "…" in the middle. They indicate that the tile on the left has to be located left of the right side tile. They however do not indicate whether the tiles are located in adjacent columns (for example can be on the first column with on the fifth column). "Next to" clues consist of two tiles. They indicate that the two tiles have to be located in adjacent columns but they don't tell which one of the tiles tiles is on the left side and which one is on the right side. "Same column" clues consist of two tiles with a double headed arrow between them. They indicate that the two tiles are located in on the same column. To eliminate a part from a tile, touch the tile to zoom it. You can then eliminate the part by touching it. If you want to undo the elimination, touch the eliminated part again. If you know which part is the correct one, you can touch and hold it for a while to eliminate all the other parts from that tile. If you want to cancel all the changes, tap the "Cancel" button. This is especially handy if you have "Auto deduce" enabled. Close the tile by touching anywhere outside of it. Log in to Game Center to gain access to global hiscore lists, cool achievements and much more! To access Game Center, tap the Game Center logo in main menu. You can dim clues that are no longer useful by tapping them. To undim a clue, tap it again. You can tap and drag clues to rearrange them. Dropping a clue on top of another makes them switch places. If you're stuck and need a hint, tap the HINT button. This will highlight a clue that you should be paying attention to. Note that each hint lowers your score. If you're still stuck after watching a hint you can tap and hold the HINT button for a while to get detailed explanation on what you should do next. Note that using the extended hint feature counts as two normal hints and lowers your score accordingly. If you want to restart the puzzle, tap the RESTART button. Note that in challenge mode RESTART creates another random puzzle. You can safely exit the game while in the middle of a puzzle. Marple will remember the game state when you return. Note! Please play through the tutorial to learn the basics! You should start by going through the "In between" clues and the "Left of" clues and eliminate tiles from the leftmost and rightmost columns. You can make the game easier by enabling "Give away two tiles" from the settings view. 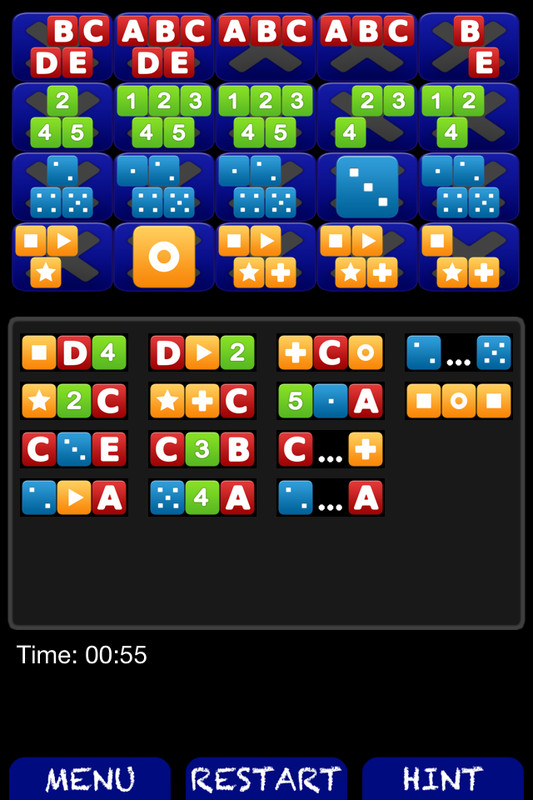 This will automatically solve two tiles but will also add two minutes to your time. If you get stuck, use the hint feature. Below is a list of some of the things that can be deduced from different types of clues. Since the middle tile has to be in between the other two tiles, it cannot be on the first or last column. For example, if the clue is , you can eliminate from leftmost and rightmost columns. Also, if one of the tiles is already known, you can safely eliminate the other two tiles from that column. Since the right side tile requires the other tile to be located on its left side, it cannot be on the leftmost column. For example, if the clue is , you can eliminate from the leftmost column and from the rightmost column. If the other tile of the clue is known and is on the leftmost or rightmost column, you can deduce the location of the other tile. For example, if the clue is and is known to be on the leftmost column, has to be on the second column from the left. If the other tile is known, so is the other one. For example, if the clue is and is known, has to be on the same column. Conversely, if some column doesn't have the other tile, it cannot have the other either. For example, with the previous clue, if some column still has but not , you can eliminate from that column as well. Remember that this was just a list of some of the things that can be deduced from the clues. As you play the game you'll find out lots of other things that can be deduced from them. There are two game modes: classic and challenge. In classic mode you can select the puzzle to be played in the OPTIONS menu and also restart the current puzzle by tapping the RESTART button in game view. In challenge mode the puzzle is always selected randomly, you don't see the number of the current puzzle and tapping the RESTART button will create another random puzzle. If you are logged in to Game Center, your hiscores obtained in the challenge mode will be sent to the global and friends hiscore lists. Tap the OPTIONS button in main menu to open puzzle selection and options view. 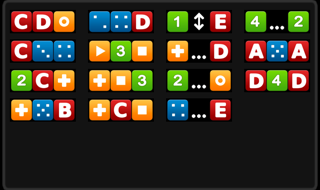 In this view you can select the current puzzle in classic mode and change various gameplay options. You can select the current puzzle by turning the dials. If you want Marple to warn you when you are making a mistake, enable "Show warnings". Note that each warning lowers your score. If you want to simplify the game a bit, enable "Auto deduce" to make Marple deduce certain things automatically. Note that Marple will not eliminate any tile parts from the currently zoomed tile. When you eliminate all but one of a certain tile in a row, Marple will assume that is the correct one. When you deduce that a given tile is the correct one at a given position in the puzzle, Marple will automatically eliminate all other instances of that tile from the row. If you want Marple to sort the clues based on their type, enable "Auto sort clues". If you want to make the game easier, enable "Give away two tiles". This will automatically solve two tiles for you. Note that enabling this feature will automatically add two minutes to your time. If you want to disable sound effects, turn "Sound effects" off. If you want Marple to start immediately in game view instead of the main menu, enable "Start in game view". Tap the HISCORES button in main menu to open hiscores view. This view shows you the top 10 results and some statistical data, including the total number of games played, total time played and average time spent per puzzle. Each entry contains player's name, puzzle number, number of warnings (W column) and the number of hints (H column). If you want to reset the hiscores, tap the trash can icon. Resetting hiscores will not affect the statistics. If you are logged in to Game Center, you will also see list of your friends' and global top challenge mode scores. Depending on the network conditions, these might not get updated immediately. In such case, try accessing the HISCORES again after a while. Please note that friends and global hiscore lists only include your best score whereas the local hiscore list includes up to ten best scores. Marple awards you with Game Center achievements for different types of achievements, such as finishing a puzzle in under five minutes. You can view the full list of achievements and their descriptions in the Game Center dashboard. If you are upgrading from an earlier version of Marple, your best hiscore and statistics will be transferred to the first user profile logging in to Game Center. Also, Marple will try to analyze your existing statistics and hiscores to award you with achievements. Q: Why do global and friends hiscores only display one of my hiscores? A: Game Center only stores your best hiscore. Q: Why wasn't my best hiscore from an earlier (1.x) version sent to Game Center? A: In order to prevent cheating only challenge mode hiscores are sent to Game Center. Q: Why didn't Marple import my statistics from version 1.x? A: You must have declined Game Center upon first launch. See the Troubleshooting section in application help for instructions on how to import your statistics.